As warmer weather and sunshine starts teasing us with spring, it’s time to start thinking about putting away the skis and getting back on the bicycle. With the ProTour making two stops in Quebec (Montreal and Quebec City) this year, it’s an exciting time to be a cyclist in Canada. 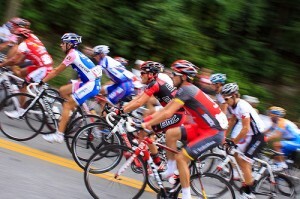 Essentially the ‘world cup’ of professional road cycling, the ProTour draws many of the same teams and riders as the Tour de France and the two other Grand Tours, the Giro d’Italia and the Vuelta a Espana, though its races are much shorter and often more intense than the multi-stage Grand Tours. 2011 will be just the second time Canada has hosted the ProTour, and will be an exciting opportunity for Canadian cycling fans to go and see the most elite athletes in cycling compete close up. But how many fans of professional cycling can there be in Canada? It turns out that despite being stereotyped as a European sport, professional cycling enjoys a sizable loyal fan base in Canada. Being fans of cycling ourselves, Abacus Data conducted a national survey of Canadian cyclists as an internal exercise. Overall, about 57% of Canadians own a bicycle; closer to 70% for those under 45. Also, about 7% of Canadians admit to being fans of professional cycling. As a percentage this is a fairly small number, but it represents about 2.2 million people, most of them in Ontario and Western Canada. More interestingly, when people were made aware of the size and significance of the event, nearly 10% of Canadians suggested they would consider attending, meaning it has the potential to be an enormous event. Cycling (be it road or mountain) isn’t just something to do on a nice afternoon; it’s an engaging, accessible, group or individual sport with a huge international network of professional athletes and organizations – and now it’s at our doorstep in Canada. For more information about the ProTour events in Quebec, click here, or follow us on Twitter.